Tiny homes have been the talk of the town for quite some time now. Although downsizing or living in small spaces isn’t necessarily new, this tiny home fad is still pretty fresh. I mean, HGTV only has four seasons of Tiny House Hunters. For them, that’s pretty new. 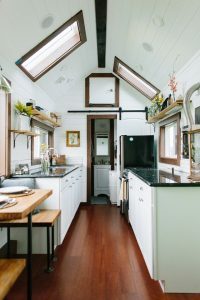 If you live a minimalist lifestyle, wish to be more environmentally friendly, or spend more time outdoors than you do in; a tiny house may be your dream home! Tiny homes are a great way to downsize (for new couples or empty nesters alike). They can also be used as a solution for people without homes; “and proponents say permitting the small structures – including as so-called in-fill development – can densify existing neighborhoods,” according to Oregon Live. There’s a lot to think about when it comes to a tiny home. Not only must you think of your “keep” vs. “don’t keep” items (like your huge sectional or dining room table— they wont fare well in the small space), but you must also think about your county laws and zoning ordinances. If we use Portland, Oregon as our example, you will find that accessory dwelling units are lawful in all residential zones (if standards are met). 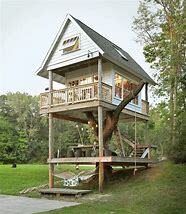 However, tiny homes on wheels (THOW) have experienced more complications. In 2017, a rule was made that excluded tiny homes from the “recreational vehicle” definition. Since the Department of Motor Vehicles uses that official definition, they stopped issuing titles to THOW owners. This was basically one big accident, as the agency said they hadn’t realized the state motor vehicles department would interpret the change as excluding tiny houses. Concern remains over how tiny homes will be regulated, and there’s still many standards to meet when purchasing or building, but the trend is still being embraced by many who are willing to jump through hoops. Making this trend the norm is already in the works— the work is being done for you! All you have to do is find the perfect tiny home for you… and would you believe you can order them on Amazon?